Finally, everything is working on my website. Go to HIOS.org or HANime.org to check it out. 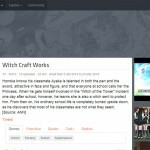 It was officially up and running on July 1st, but HANime.org had some difficulties parking properly. Anyway, all my journal entries will now be located at my Official Homepage. See you there! Ayu is my most favorite J-Pop female vocalist ever!!! “Evolution” is my most favorite song of hers. Ever since I heard her single, “Boys and Girls”, way back in 1999, I’ve been obsessed with her music. There is no doubt in my mind that she’s now the reigning queen of J-Pop. My current goal is to collect all of her CDs and DVDs. Ganbatte, ne?